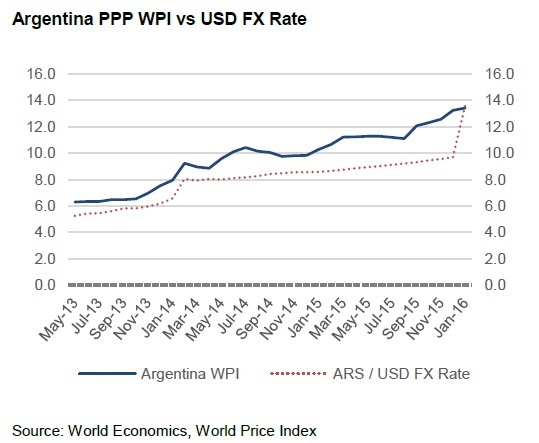 The latest set of World Price Index (WPI) data indicates that the Argentine Peso is now 1.5% undervalued against the US dollar in Purchasing Power Parity (PPP) terms. The methodology behind the WPI involves collecting price data for a representative basket of goods across different countries. This allows the measurement of the real purchasing value of national currencies across the world in terms of their relative purchasing power against a comparable basket of goods in the US. The data for January shows a sharp realignment of the Argentinian currency from an overvaluation of 36.6% in December to its position close to parity in January. Last month on the foreign exchange markets the official rate was one US$ bought 9.68 Pesos while this month a significant depreciation of Argentine’s currency by 40.1% meant that one US$ could be exchanged for 13.62 Pesos. 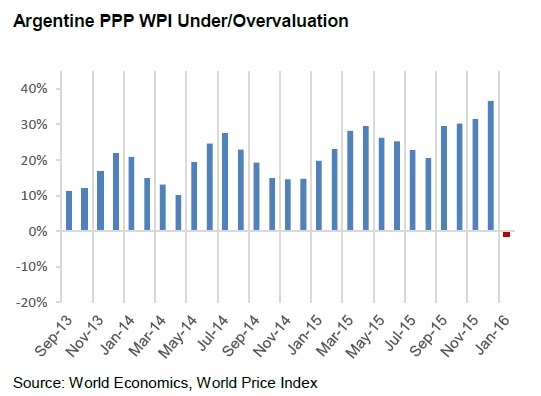 In contrast, the WPI rate for December was one US$ to 13.21 Pesos while the PPP rate for January was one US$ to 13.41 Pesos, a fall of only 1.4%. 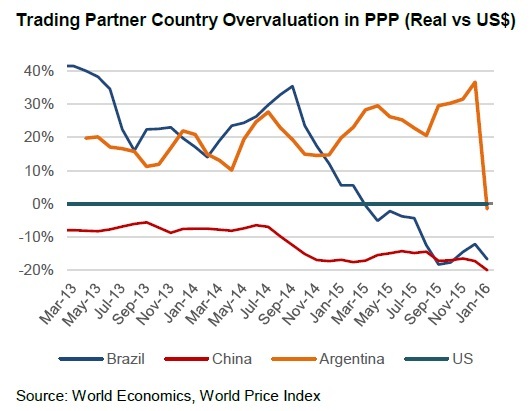 The reason for the sharp realignment of the Argentine Peso up close to its PPP fundamental value lies in the country’s move to give up on the policy of currency manipulation. The newly elected president Maurizio Macri has moved swiftly towards implementing economic reform and a decision was made to allow a free float of the Peso on currency markets from December 15. This ended the long period of currency control carried out by the previous administration which used the central bank’s reserves to prop up the Peso effectively rationing dollars to importers creating the coexistence of an official exchange rate and a ‘blue chip’ or unofficial rate, which was around Pesos 14.2 to the US$, much closer to the WPI rate. The decision to liberate exchange rates is intended to restore the confidence of international investors in order to attract investment and to boost growth rates. However, a lower currency could worsen inflation in the short-run implying that the Peso may move further towards undervaluation away from its WPI rate until Argentina’s access to capital markets is fully restored after a long fight with international creditors has been concluded satisfactorily. In January the undervaluation of the Brazilian Real increased to 16.6% against the US$ from 12.2% the month before. This month the currency’s foreign exchange value was R4.10 to a US$ compared with a WPI rate of one US$ to R3.35. Last month one US$ bought R3.83 in the currency markets, while the WPI rate was one US$ to R3.37. There has been a significant change in the Real-Dollar exchange rate over the last two years as the Brazilian economy and confidence in its political leadership have nosedived. In January 2013, one US$ bought R2.02, half the current amount, which against a WPI rate of R2.75 at the same time produced an overvaluation of 35% against the Dollar. 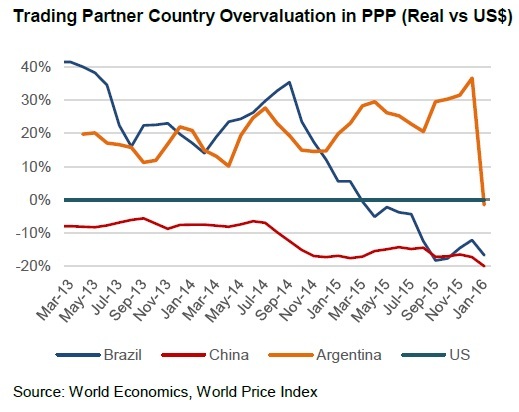 Since then the Brazilian currency has steadily fallen on international exchanges hitting close to parity with the dollar in PPP terms by March of last year and moving further into undervaluation territory since then. The fall in the nominal exchange rate of the Real against the dollar was initially a delayed market reaction to the deteriorating external balance in the Brazilian economy which swung from trading surpluses to a deficit of 4.2% in 2014. The external balance returned to surplus in 2015 and a record surplus of US$6.24 billion was earned in December 2015, compared to a US$0.29 surplus a year earlier. However, much of this improvement reflects recessionary conditions as GDP in 2014 almost stood still and is expected to have fallen by 3% in 2015. In December 2015, imports fell by 39% in value terms. The weak currency reflects the fact that that confidence in the Brazilian government is low in its ability to stimulate economic recovery. Public spending is out of control rising strongly in 2014, as Ms Rousseff sought re-election as president. The budget deficit doubled to 6.75% of GDP and its planned primary surplus for 2015, which excludes interest owed on debt, of 1.2% of GDP is now expected to turn into another 0.9% deficit. Public spending could crowd out a recovery in private sector demand which is restricted by high interest rates of 14.26% because of the government’s failure to control inflation. Economic conditions inside Brazil are not expected to improve soon. The World Economics Sales Managers’ Index (SMI) of Business Confidence in Latin America (in which Brazil contributes a major share of the region’s economy) has shown a steady fall in optimism across the region since September 2013 (See Chart). 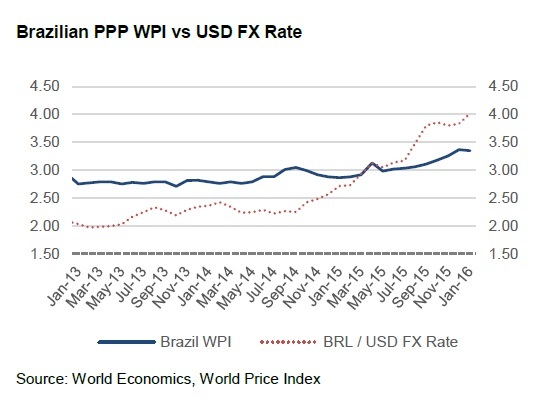 The WPI data on the depreciating PPP value of the Real and these policy measures indicates that the Brazilian economy is facing the danger of slow growth and persistent inflation or stagflation which explains the decline in Business Confidence. The World Price Index (WPI) measures the value of an urban selection of goods and services at purchasing power parity (PPP), reflecting the real purchasing power of different nations, allowing for rapid and accurate international price comparisons. Under/Over valuation data is based on the difference between the exchange rate value of a currency and that of the US Dollar in relation to the World Price Index calculated exchange rate. 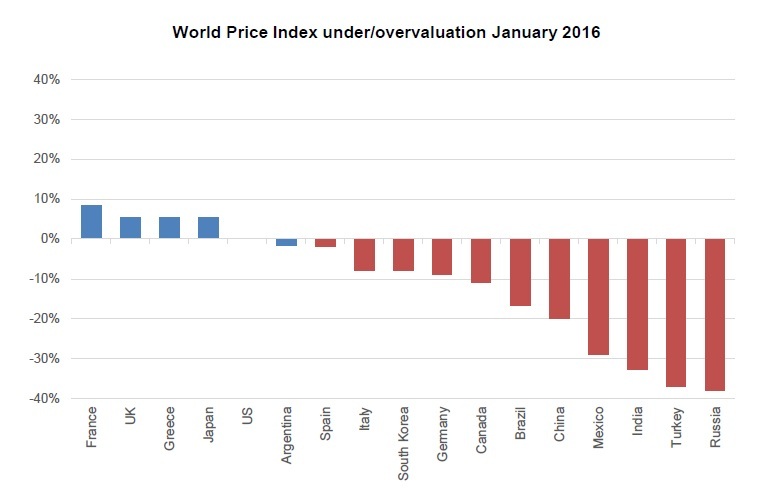 Based on WPI global data the degree of currency under or over valuation in PPP terms by country is provided in the table and chart below. The World Price Index is released on the 2nd Working Tuesday of each month. World Economics is an organisation dedicated to producing analysis, insight and data relating to questions of importance in understanding the world economy. Its parent company Information Sciences Ltd has a long history of the development of key business information today used throughout the world, including the origination of the Purchasing Managers Indexes in Europe and Asia (now owned by Markit), and the development of WARC a global information provider for major corporations . World Economics welcomes your feedback, which should be addressed to Amelia.Myles@worldeconomics.com.